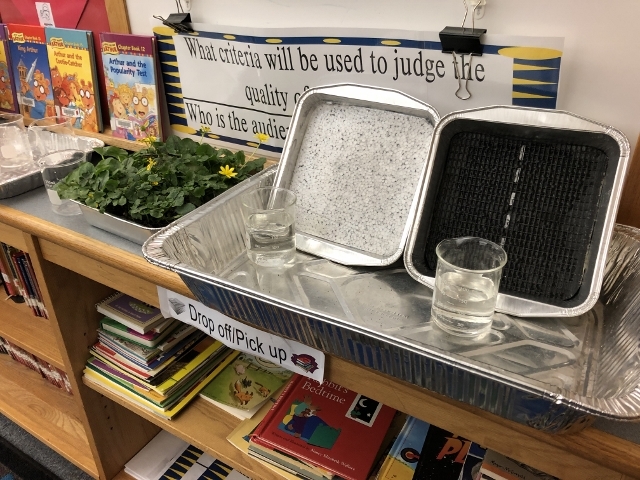 Jessica Cuevas and Anita Grimley, third grade teachers at the Ross School in Margate, are teaching children about non-point source pollution. Students will join community volunteers in a storm drain labeling program. MARGATE – Students in the William H. Ross Elementary School and the Eugene A. Tighe Middle School are collaborating with the city and community groups to ensure the ocean stays healthy. 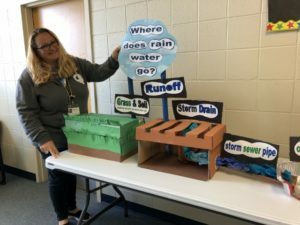 Under the leadership of teacher Jessica Cuevas, students, staff, parents and community volunteers will participate in a citywide program that ensures only rain goes down the drain. Volunteers and city workers, members of Sustainable Margate green team, the Police Department and Margate Education Foundation will be conducting storm drain labeling project Monday and Tuesday, April 15-16 in the neighborhood near the schools to illustrate an important message – that water pollution can be prevented. Stencils and door hangers will educate the public that only rain should go down the drain. 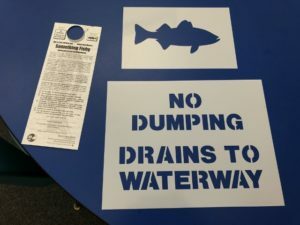 Students will stencil the message, “No Dumping – Drains to Local Waterway,” and a little fish next to storm drains on streets north of Jerome Avenue. Police will be on site to ensure the students’ safety. The Public Works Department is providing some support to complete the project, which is designed to raise awareness about dumping pollutants into underground pipes that carry stormwater to the bay and ocean. Cuevas said she was inspired to tackle the environmental project last summer after the U.S. Army Corps of Engineers installed several 48-inch stormwater outfall pipes on the beach. The pipes prevent rainwater from streets filling the area between the newly built sand dune and the city’s border-to-border bulkhead. 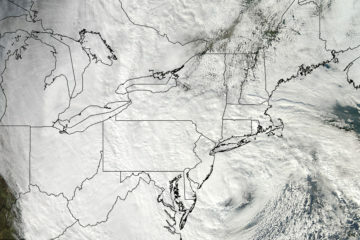 “Some people mentioned they thought the water gets cleaned before it gets to the ocean. But it does not. We thought this would be a good way for the children to learn the difference between storm drains and the sewers, hoping they would share what they learn with their parent and grandparents, and help to reduce pollution,” Cuevas said. The students spent four weeks planning the effort and learning about non-point source pollution. Pre-activities include third graders researching water pollution and creating 3-D storm drainage systems. 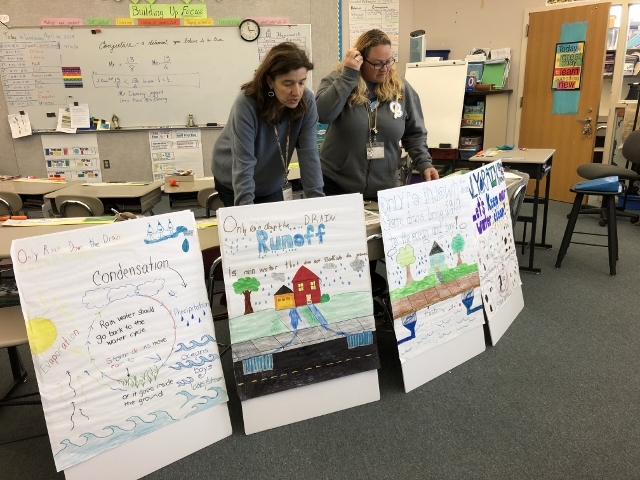 Third grade students in Cuevas’ and Anita Grimley’s classrooms worked in teams of four to create informative posters that prompt discussions, Grimley said. Students also wrote their own skits and presented them to their peers in first through fourth grade classrooms. “We didn’t want to present the skits in an assembly because we wanted the kids to really experience sharing what they learned, and get some feedback from other students,” Grimley said. 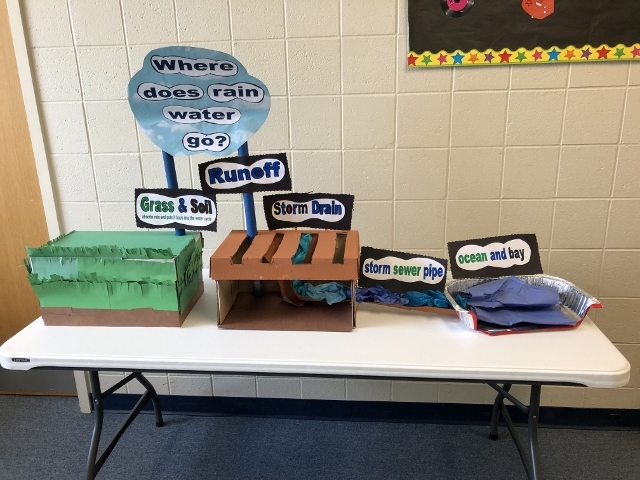 Tighe students created original artwork illustrating the theme: Only Rain Down the Drain. 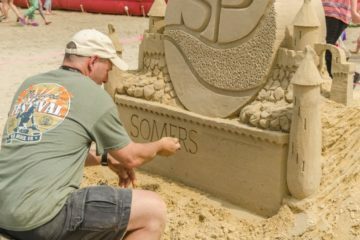 Student Greyson Afantis drew a picture of a massive stormwater pipe on the beach and Sadie Heyman drew a sky filled with raindrops. 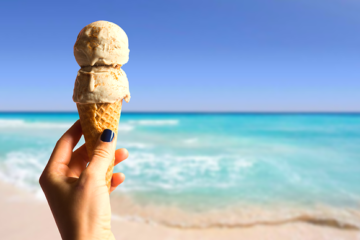 The artwork will be reproduced on glossy cards, along with information about how to reduce water pollution, which will be displayed on a double-sided card rack wherever beach badges are sold. The cards will also be shared at the Margate Public Library and at local businesses, Cuevas said. The program was funded through a $900 grant from the New Jersey Education Association’s Pride Program, Cuevas said. Non-point source pollution occurs when rainfall washes away chemical fertilizers, herbicides, insecticides, salt, oil, grease and other toxic urban runoff. Bacteria from pet waste also gets into the storm drains when it rains. Students also learned how impervious surfaces increase runoff, instead of percolating into the soil. Cuevas said she hopes the city’s green team, Sustainable Margate, and other community groups will enlist volunteers to continue the storm drain labeling project in other parts of town.